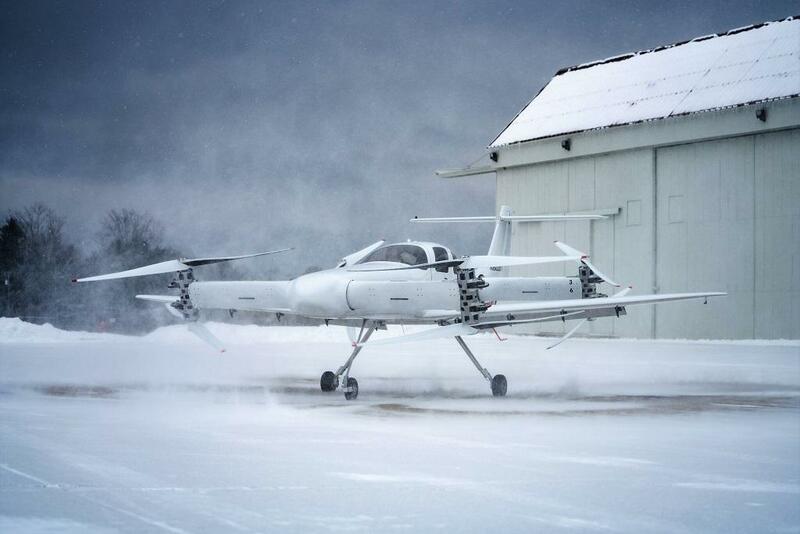 The Beta Technologies prototype Ava XC lands during a test flight at the Plattsburgh International Airport. Electric transportation offers the promise of rapid travel and zero emissions, often seen in the increasingly sophisticated electric cars that can travel 200 to 300 miles on a single charge. But electric air travel poses unique challenges, not the least of which includes swapping a jet fuel-powered engine for a battery-powered aircraft. Now the South Burlington- and Plattsburgh-based Beta Technologies is demoing an electric "air taxi" that the company says will be the electric aircraft at the center of planned cross-country flight this summer. The idle Ava XC prototype displays its eight propellers and eight motors along with its 35-foot wingspan. Kyle Clark, an engineer and president at Beta, joins Vermont Edition to talk about the eVTOL—or electric vertical take-off and landing vehicle—the company is developing, the benefits of electric aviation and the challenges still facing electric air travel. Broadcast live on Monday, Feb. 4, 2019 at noon; rebroadcast at 7 p.m.
How Is Vermont Preparing For Self-Driving Vehicles? There's been a lot of hype over the years about the future of autonomous vehicles – though mostly in cities, like San Francisco. But Joe Segale, the Vermont Agency of Transportation's director of policy, planning and research, would like to see self-driving cars being tested on Vermont roads. Have We Finally Reached The Age Of The Electric Car? There are some positive virtues of electric vehicles, like reducing carbon emissions created by conventional gas-powered engines. But where does the money meet the road? Far too often when we need to make a run to the store for groceries or other goods, we hop in the car or truck. But wouldn't be great to use your bike for a chore like that? If only your bike had the capacity to hold all those bags of stuff. In Brattleboro, there's an organization working to get more people on electric-assisted "cargobikes" to fill this need.